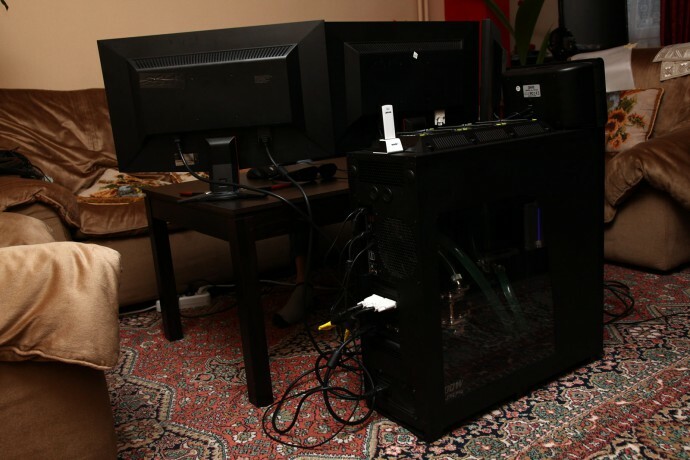 Originally I had planned to test the new GeForce GTX 590 dual-GPU video card with the 3D Vision Surround setup, but due to some issues with the test system I ended up with testing using my water cooled 3D test system that has two GTX 580 in SLI. The video cards were running at their stock frequency, and the processor – Intel Core i5 2500K was overclocked to 5GHz on Asus Sabertooth P67 motherboard and 4GB of DDR3 memory. These specs are important as below I’ll be posting some results of the framerate achieved in different games when running them in the full 5760×1080 resolution in stereo 3D mode using the 3D Vision Surround Setup. The games were run with maximum details and no AA, unless some of the extras had to be disabled in order for the game to look best in stereoscopic 3D mode, but that is also noted below. The goal of the testing was to first see if the game will be able to start with the 3D Vision Surround enabled, and if so will it work fine and is it comfortably playable on three 3D monitors as it would be on a single monitor. The games used for the test were pretty much recent and popular titles with just a few older ones and pretty much the games I had installed and am using for testing and to play, there was no specific selection made prior testing. Have in mind that I’ve used the latest beta drivers 270.51 as one of their noted features was significant improvement for 3D Vision Surround, but as this is a beta driver it is quite possible that the final WHQL version will handle better and may resolve some of the issues that are present with games that I’ve tested. So do not judge 3D Vision Surround in overall only based on my first experience with it shared here, I do plan to do more extensive testing later on as this was more like of а “getting acquainted” with it. I did not have much time to dedicate to each of the tested games to find a workaround or a solution to improve the experience or compatibility, so in the future I may work a bit more on that too. Works almost perfectly with 3D Vision Surround, the menu and gameplay is rendered on all three displays, the HUD is on the center screen, what more can you want from a helicopter simulator. Now the only thing left for you is to learn how to pilot that damn thing, as it is most certainly not an easy task. The sequel to the successful Assassins Creed series works surprisingly good in stereo 3D mode on one or three monitors, so it is something that you should definitely check out if you still haven’t. The game renders the menu and the cutscenes on the center display only and the HUD is rendered only on the central display, making it more comfortable to follow the information contained in it. So the only a bit annoying thing is the fact that the cutscenes that are not pre-rendered video are squeezed to the center screen, while everything else is pretty much great. Performance wise, the game manages to provide you with a steady framerate of about 50 fps per eye which is more than enough for comfortable gameplay. This game works very good on three monitors with 3D Vision Surround, the menu is on the center monitor, the rest is nicely visible on all three displays with the HUD being positioned on the center screen for optimum usability. The only thing you may not like here is that the performance is just on the edge of about 25 fps per eye with all details set to maximum, so you may need to do some compromise with the level of details in order to get better performance for more comfortable gameplay. This one does not work that well to start with in stereo 3D mode on a single display and on three in 3D Vision Setup it also has some issues, like for example the HUD on all three monitors and wrong FOV, not to mention there are issues with activating the stereo 3D mode and the performance is actually quite low to an uncomfortable framerate for playing. A 3D Vision ready game that works great on a single monitor and it works on 3D Vision Surround quite well, the menu and gameplay is rendered on all three displays and the HUD is on the center display. However the issue that you will most certainly face is with the FOV, the default in-game value of 85 gives you a kind of zoomed in view when you play the game on 3 displays. The simple workaround is to edit the config file and change the value for the FOV from 85 to 140 and you should be Ok in the game, although the menu still looks a bit cut out. With all details set to maximum the game remains perfectly playable with about 38 fps per eye average framerate, so it is worth definitely trying out with 3DVS, just don’t forget to fix the FOV. Another good game for stereoscopic 3D gaming on a single monitor that also works quite well on three displays in a 3D Vision Setup. The menus are mostly on the center display with a few elements “escaping” to one of the side, the game itself displays well on all three displays, but the HUD is stretched to all three displays, meaning a lot of the menus on the leftmost and the rightmost parts of the side displays which is a bit uncomfortable, but it is something you can learn to work with. This game has generated a lot of interest lately, so it was natural to test it with 3D Vision Surround, but unfortunately it did not work that well as I had expected. The in-game videos get stretched and cut at the top and bottom due to the wrong aspect ration, but actually the more serious issue was that when in the menu or inside the game (shown on all three displays) you could only see image through one of the eyes and the other one is black. I’m sure this issue will be resolved when the first R270 WHQL drivers come out, and I’m suspecting that the issue might be caused due to the way that the game has the 3D image creating implemented. I know that Crytek focused more on consoles with the game, where you don’t have more than a single monitor, but I hope that they did not completely forget about the PC users, so they can also help improove 3DVS compatibility with future patches as well. This is another game that works great in stereo 3D mode on a single monitor, but has a strange issue when you try to make it work on 3 monitors using 3D Vision Surround. The game sees the additional higher resolutions, you can choose and set them, but this does not change anything as the game remains displayed only on the center display and the stereo 3D mode does not kick in. Not sure if this is related to the game itself or might be fixed with new video drivers, but when the R270 WHQL release comes out we’ll probably know what is causing it. to 30 fps per eye. This one looks quite decent with 3D Vision Surround, but isn’t the most comfortable to play with more than one monitor due to the fact that the cutscenes are being rendered on a single monitor only and the HUD is stretched on all three displays with the biggest part actually being the panel at the bottom of the screen. The performance you can expect isn’t that high as well, but should be enough for comfortable gameplay – a bout 35 fps per eye. Another pleasant surprise, but you can say that it is expected from such a simulator friendly game to offer good multi-monitor support, so yes, F1 2010 works great with 3D Vision Surround. The in-game menus and the gameplay is great on all three displays, the HUD is shown on the center display and with maximum details the game manages to provide you with a steady framerate of about 60 fps per eye. So this game is a must for a good stereo 3D experience on multiple monitors, although the game itself is considered by many as not that well made. This is a 3D Vision ready game, so expecting it to perform good in stereo 3D mode on three displays with 3D Vision Surround is normal and the game does exactly that, but with all details at maximum the performance may be a bit on the edge for comfortable gaming. The game menus render on all three displays, as well as the HUD which may be a bit distracting, but you can learn to deal up with that, as it is not that big of an issue. It works great in stereo 3D mode with 3D Vision Surround on three displays, the menu is rendered on all three displays and the HUD as well, but since it is quite minimal that’s not a big problem anyway. The performance with maximum details is a solid 60 fps per eye. So in general you should not have any serious trouble with other games using the same game engine in 3D Vision Surround mode. Forget about this one on 3D Vision Surround mode for now, everything gets stretched to the 3 monitors and the FOV is wrong making the game unplayable by default, unless maybe you find some tweaks to fix the FOV. The framerate is about 40 fps per eye, so fixing the issues can make it playable, if possible of course. The game refuses to launch with a resolution of 5760×1080 with an error message that the system may not have enough resources to start at the selected setting. It starts at a bit lower resolution and shows on all three displays, but the image is stretched on all three displays from a resolution intended only for the center screen, so everything is with the wrong aspect ratio making it unplayable. This is a 3D Vision-ready game, supporting PhysX and apparently made with 3D Vision Surround support as well. To tell you the truth I was pleasantly surprised when in the options I saw 3x 1080 resolution instead of the typical 5760×1080, but that is when I immediately got it that Mafia II should work great with 3DVS. The menu is shown on the center screen only, but the rest is on all three, and as expected the HUD was available on the center screen. With maximum details, 2xAA and PhysX set to High the game still managed to provide an average of 50 frames per second, making it comfortably playable with 3D Vision Surround. This was another very nice surprise for playing in 3D Vision Surround setup as the game menus and the game itself display great on the three monitors. The game needs to have the Shadows set to low for the best stereoscopic 3D experience, but other than that with all other details set to max it manages to provide an average of about 60 fps per eye. The in-game HUD is rendered on all three displays, but it isn’t that big of an issue as it is quite minimalistic and you can easily get without having to pay attention to the few icons you get on the two peripheral displays. This games works quite well in stereo 3D mode on a single monitor provided that you disable the Shadows, and trying it on three monitors with the 3D Vision Surround it also worked really well with an average framerate of about 60 fps per eye, so the performance was not an issue. The game menu is only on the center screen, but that isn’t a big issue, unlike the fact that the cutscenes are also displayed only on the center screen which kind of annoys. It gets you annoyed, because it is not pre-rendered video that is Ok to be displayed on a single screen, but is actually 3D renders from the game, so it could’ve easily been on the three displays and that switching between one and three monitors while you play isn’t that comfortable for the player. Another thing is the HUD, it is being rendered on all three displays, so it is hard to track all the data easily while you are being focused on the center screen. But even with the small things that could be improved, the overall experience playing NFS: Hot Pursuit with 3D Vision Surround was great. You probably know that the latest NFS game has some issues in stereo 3D mode, but that did not prevent me from trying it out with 3D Vision Surround. However the game was crashing after the intro has finished and I get into the main menu, this can probably be resolved within the WHQL video driver or with a game patch. This is a game using the same engine as Half Life and thus has no issues working with 3D Vision Surround, everything looks quite Ok on all three monitors and the performance is again solid 60 fps per eye. The game does not work with 3D Vision Surround as there is no setting for resolution over 1920×1080 in the game menu. It might be possible to make it work via some tweaking of the settings in non-traditional way, but I did not have enough time to try to find such. The game crashes when trying to set it in the max resolution of 5760×1080 to run with the 3D Vision Surround mode, however trying to set a lower resolution to use with the three monitors works. Unfortunately even though it runs, the game is displayed with wrong aspect ratio of the image, so it is pretty much unplayable. A typical console port without too much attention on the PC version that unfortunately does not work with 3D Vision Surround. When switching the resolution to 5760×1080 to display the game on the three monitors it gives an error (“Too many Vertices”) and crashes. When the game is ran again it starts, but with wrong aspect ratio and the actual image to be displayed gets cut at the top and bottom of the screen. Trying to actually start the game leads to black screen and nothing happening, so the game basically hangs while loading the first mission. The game does not start with 3D Vision Surround, you get black screen and hand there with nothing happening, not sure where exactly the problem may be with this one, but it probably needs one or two more patches to finally bring everything up and working. 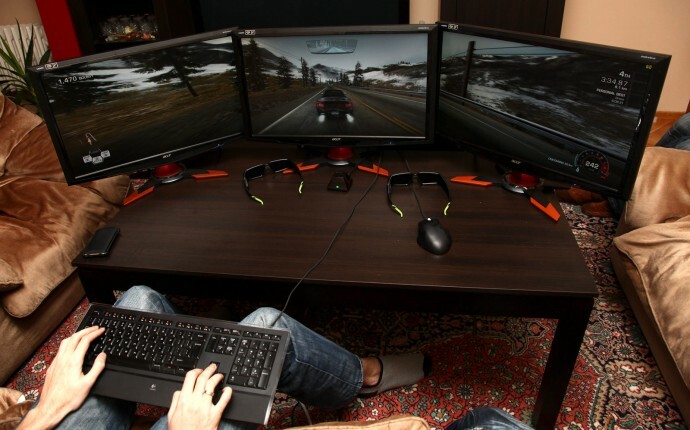 This is one pleasant surprise with 3D Vision Surround as it works on three monitors as well as with one monitor in stereo 3D mode, the menus and gameplay works fine on three displays. The performance is not an issue as the game is quite light on the requirements. The only not so good thing is that the HUD is shown on the three displays, but the main and most important part is at the center screen, so that isn’t actually a big problem. This is a bit old game already, but it is looking great in stereo 3D and not very heavy, so I’m often using it as a test, so I could not resist to also try it out in 3D Vision Surround mode. The game menus are rendered on the three monitors, the videos are shown only on the center screen and the HUD is on the left and center monitor, but since it is quite minimal that is not such a problem. Since the game is not so heavy on the hardware it easily manages to hit the 60 fps per eye average framerate and pretty much the only thing that prevents a great rating is the fact that when you call in the game menu after starting playing it is somewhat strangely messed up. It has turned out quite hard to get three 3D monitors of the same model just for testing, so I invited a friend to bring his own 24-inch Acer GD245HQ and together with the other two monitors I’ve managed to get we started testing multiple games yesterday and it was a long day. Originally I planned to do the testing in 3D Vision Surround mode with the GeForce GTX 590 video card, but do to some hardware trouble with the test system used for the 590, I had to change the idea on the go and move to my test PC with dual GeForce GTX 580s in SLI. I’ve had a big table planned for the three monitor setup, and we barely managed to fit the monitors on it… 3D Vision Surround setups even with 24-inch monitors do need a lot of space for comfortable use, and if you plan to do it with the new 27-inch monitors, you should really have a lot of free space. Other than that the setup and installation was quick, easy and problem free in general, so we moved to the testing phase and sometime early in the morning today we’ve finished with going through about 30 games in 3D Vision Surround. During the testing there were some interesting, unexpected and surprising results, so you should be prepared that not every single game will work problem free, some require a bit of tweaking and a few just don’t work. In general however the experience when everything works out is great and you quickly start to not pay too much attention to the bezels of the screens and get fully immersed in the gaming. Acer just announced a new 23.6″ 3D monitor, namely the Acer HS244HQ which is also the first on the market to deliver Full HD 3D support via the new HDMI 1.4a standard, meaning that you can use this monitor with just about any 3D-capable device that outputs stereoscopic 3D content in frame packaged format according to the HDMI 1.4(a) specs. 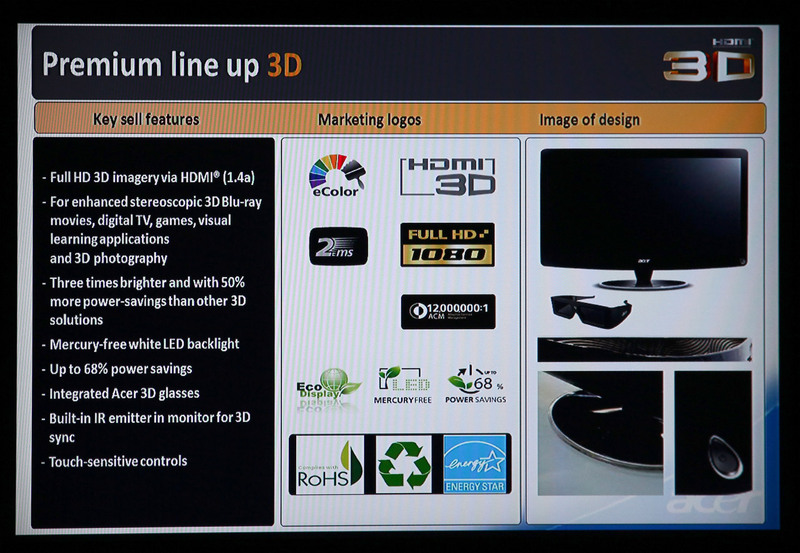 This means that you will be able to use this monitor for example together with your PlayStation 3 console to play games in stereo 3D, instead of having to buy a more expensive 3D HDTV, but that pretty much goes for any other device that uses the same standard for outputting S3D video in some form. According to Acer, with currently available 3D shutter technology (probably meaning 3D Vision), the monitor brightness dramatically drops to 16% of normal when in 3D mode, however the new active shutter glasses that Acer is bundling with the HS244HQ 3D monitor you should be able to get tree times that brightness level or around 50% of the light displayed by the monitor. 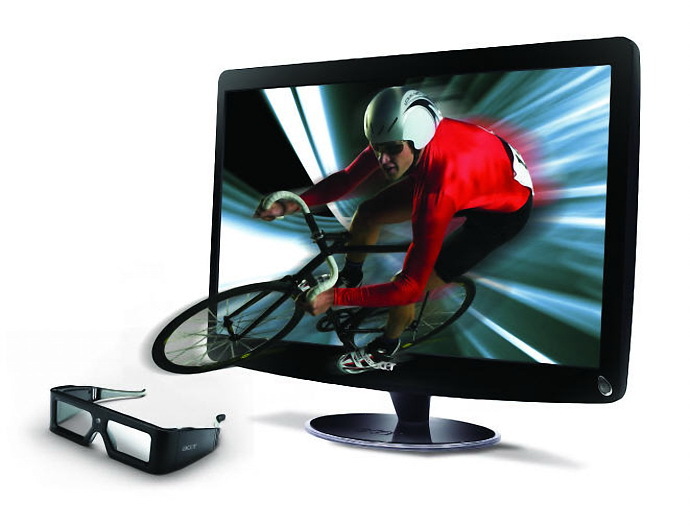 Of course the monitor comes with a built-in IR transmitter to synchronize the glasses with the stereo 3D image being shown on it. From what I’m seeing on the currently available photos, the glasses seems much like those bundled with the HP Envy 17 3D laptops and much like the ones made by Xpand, so it is quite possible the glasses are the same. So indeed they are more brighter than the 3D Vision from what I’ve personally seen, although there might be some differences with the glasses coming with the Acer monitor. According to Acer this new monitor should be capable of achieving 12,000,000:1 contrast ratio (dynamic of course) thanks to its LED backlight, something that is quite impressive as a number at least, but in real world use it might not be comparable to the level of contrast and black/white levels you get with a plasma TV for example. And of course you are getting Full HD native resolution with support for 3D, however what is important to note here is the fact that this monitor will feature only two HDMI 1.4a connectors that support stereo 3D, so there is no Dual-Link DVI anymore available. This also means that you will also be constrained to the limits introduced by the HDMI 1.4a specifications regarding stereo 3D support – 720p 50/60Hz 3D mode and 1080p 24Hz 3D mode, and no 2D mode with full 120Hz refresh rate, although the LCD panel should be perfectly capable of that. These limits are implied by the HDMI 1.4(a) standard and the specifications defined in it, so there is not much you can do, however Acer has more interesting new 3D-capable models that will be announced in the next few months that will offer an alternative to that. Acer already has available for quite a while 23.6-inch Acer GD245HQ/GD235HZ 3D Capable LCD monitor, that only supports frame sequential Dual-Link DVI input for stereo 3D content, and the company just announced 23.6-inch Acer HS244HQ, that will only work with frame packaged stereo 3D content as defined in the HDMI 1.4a standard. But in the beginning of 2011 the company will gradually introduce additional 3D-capable LCD monitors with different sizes, capabilities and for different segments, thus becoming the brand with the widest gamma of 3D-capable LCD monitors on the market.